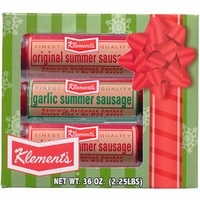 Wisconsin made Klement's Sausage in a gift boxed set just for Christmas. You get 2 12 oz. original summer sausage and 1 12oz garlic summer sausage in each gift box.